Let me preface this post with the following statement: IMMERSION BLENDERS ARE THE BEST. You can seriously make so many different things with them, and you don’t have to worry about cleaning the inside of a blender. It’s amazing. Want a slushie? Blenderize it in the cup you want to drink with this thing. Got soup you want to purÃ©e? No problem, just purÃ©e Â in the pot. No need for blending in batches and worrying that the steam from the blender will kill you. Guacamole? Velvety smooth with this thing and you don’t need to waste any delicious green goo because you can’t get to it in the blender. But enough about blenders, more about this soup. This soup is the epitome of fall: orange for the changing of the leaves; it’s lovely and warm for the cool weather outside; this is the time of the year where butternut squash comes out to shine; and the spices and velvety texture in this soup just beckon for a cozy latte and blanket afterwards. AND it’s super healthy because it’s basically just carrots and butternut squash. Oh and vegan. OH NO. I just realized that I wanted to add some ginger to this. Drat. 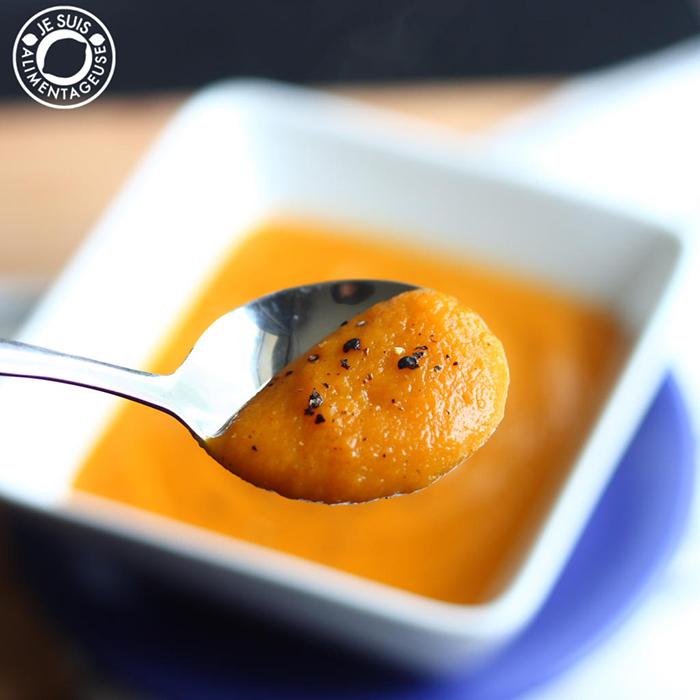 A spiced soup that warms you from the inside. Perfect for holiday dinners or to freeze for those lazy days you just want something quick. Preheat a pot on a stovetop at around medium heat. Fry up the onions and garlic in the sunflower oil until translucent and fragrant. Add the chili powder, garam masala, garlic powder, allspice/cinnamon and cayenne powder (basically all the spices you want) and stir until those are nice and fragrant. Add the flour to make a roux, mix until incorporated, then add the vegetable broth. Bring up to high heat to a boil, then add the squash and carrot cubes. Simmer over medium heat for about 10 minutes, then bring it down to a medium low for another 20 minutes. Poke the bigger pieces of squash and carrot with a fork to see if they're tender. If you can pierce through very easily, then you're ready to blenderize. Blend either in your blender or with an immersion blender until velvety smooth.Add salt to taste. VERY happy to see this. I just bought a squash but was thinking I wanted a new version of squash soup, and here you are! Thanks! No problem =) I hope you like it! 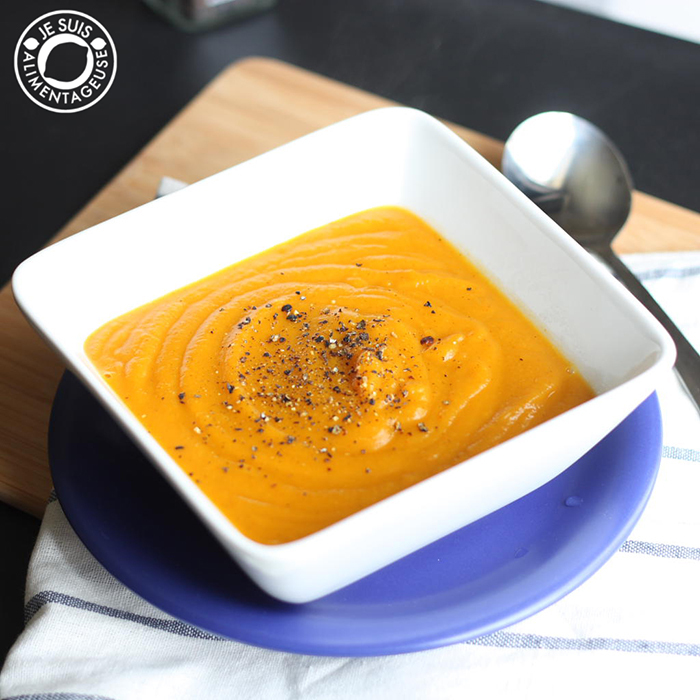 butternut squash...carrots...soup - what could be better combined?! thanks! I love butternut squash soup and love carrot and ginger soup, but somehow I never thought to put them together. Definitely trying this soon!Also, I am totally with you on the immersion blender. I didn't realize how frequently I used mine until I started blogging! I think ginger would give it that extra kick that would bring this soup to the next level =) And right? Immersion blenders are the best! This looks great! How much does this make? Is it enough for leftovers? What a perfect soup as we move into the fall season. Your pictures have my mouthwatering. Elegant and lovely.